BonChon Philippines is without a doubt among the fastest-growing quick service restaurants selling fried chicken in the local market. Crispy fried chicken is not the first thing that comes to mind when one thinks of Korean food, but Chicken BonChon (“original village” in Korean) is on the way to changing that. Scott Tan, 31, the master franchisee for the Philippines of the Korean brand, had unveiled BonChon’s way of frying chicken—that is, it’s done without breading. The sweet soy-garlic chicken, which also comes in a spicy variety, is definitely a new taste but not intimidating to the Filipino palate, and thus is taking Metro Manila by storm. 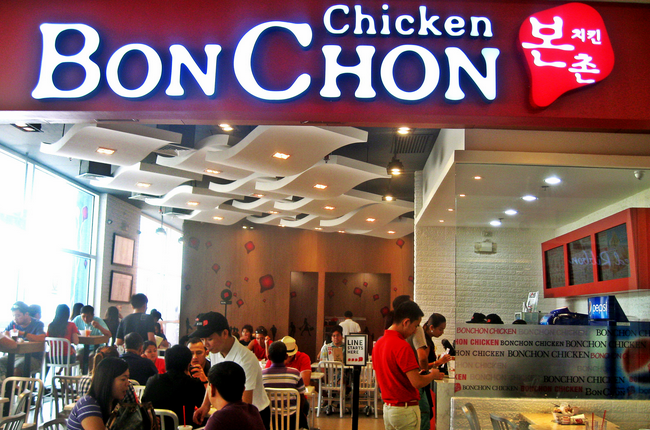 BonChon Chicken Philippines opened its first store in November 2010. In just over 18 months, it has grown to 18 branches (two franchised, the rest company-owned) all over the metropolis. Currently, it has 87 locations, 80 in Luzon and seven across Visayas and Mindanao. That makes it one of the fastest-growing fried chicken-based quick-service restaurants (QSRs) in the country—apart from being the biggest Korean–style crispy fried chicken chain locally. “From day one I was amused that a lot of people knew about BonChon already,” says Tan. “From there, it kinda spread easily, and then more and more people started talking about it through social networks.” It’s no surprise then to find most of BonChon’s branches in malls and near prominent universities. The breakthrough for Tan was when he broke away from BonChon’s sports bar-type format in New York, where the brand arrived (and became a hit) in 2007 just five years after it began in Korea. “When I brought it here I made it a QSR because if I made it into a bar it restricts a lot of people from coming in,” he says. That flash of insight paid off, and BonChon has become a family place for Filipinos. Tan hopes that with more franchisees, more Pinoys will get to enjoy chicken fried the Korean way. This article was originally published in the July 2012 issue of Entrepreneur magazine and was recently updated by the online editor. Subscribe to the print or digital version here.